Cancer Fund for Children provide practical and emotional support to children and young people diagnosed with cancer or living with a parent diagnosed with cancer. They offer support in their home, community, on the hospital ward and at their residential centre so that no family has to face cancer alone. The money raised will go towards the running of their therapeutic short break centre, Daisy Lodge in Newcastle Co. Down, and their therapeutic services which include individual support, residential group support and bereavement support which is delivered by the charity’s team of Cancer Support Specialists. 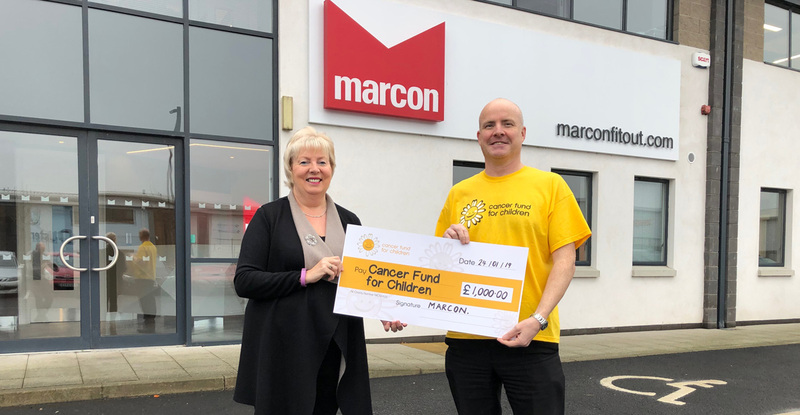 The sad reality is that every week in Northern Ireland another three children and young people aged 0-24 years old will be diagnosed with cancer which is why Marcon employees decided to fundraise for the charity. Caption: (l-r) Eileen Johnston, Marcon presenting the cheque to Leo Donaghy, Corporate Fundraiser at Cancer Fund for Children.